In 2006-2007, according to the Maternity Experiences Survey (MES*), 90% of women started breastfeeding after they gave birth. 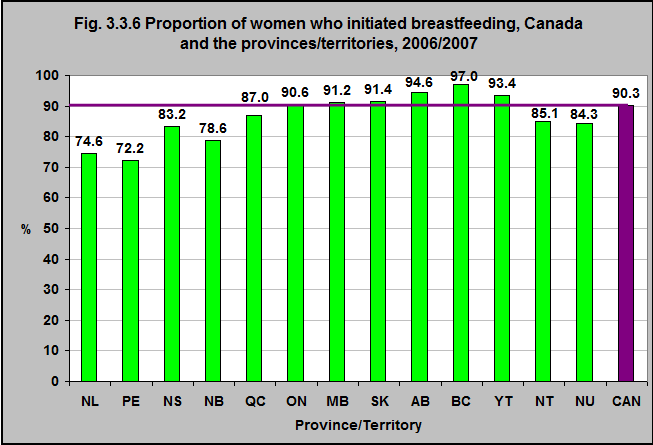 The percentage of women who initiated breastfeeding generally increased from Eastern Canada to Western Canada. 75% of women in Newfoundland & Labrador and 72% in Prince Edward Island initiated breastfeeding after giving birth. 97% initiated breastfeeding in British Columbia.